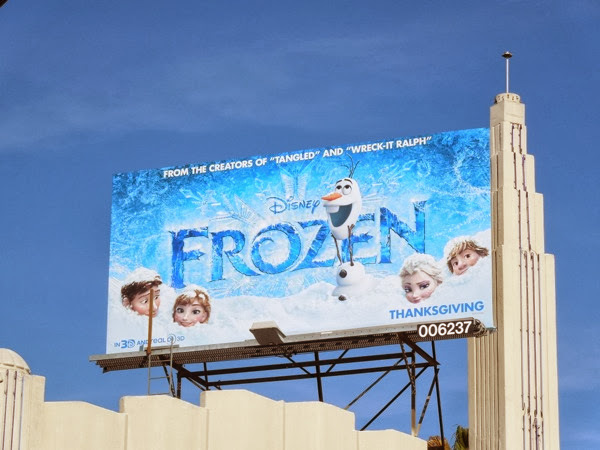 These wintery billboards for Disney's new animated feature Frozen stand out even more against L.A.'s sunnier skies, but Daily Billboard imagines they may not be so inviting in chillier climes. Saying that, we're heading into the most festive time of the year and who doesn't love seeing a funny snowman to cheer you up. 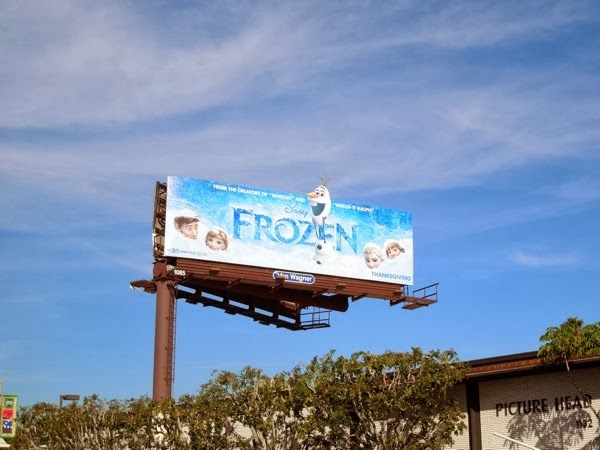 The hilarious 'Olaf' is just one of the new characters in Disney's 53rd animated classics series, which is inspired by the Hans Christian Andersen fairytale The Snow Queen. Kristen Bell voices the fearless 'Anna' as she embarks on an epic journey with the rugged mountain man 'Kristoff' (Jonathan Groff) and his loyal reindeer 'Sven', facing mystical trolls and the harsh elements to find her sister and save the kingdom from eternal winter. 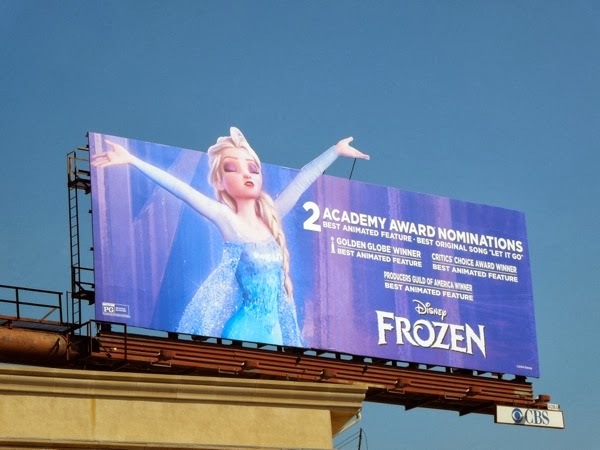 Her sister 'Elsa' (voiced by Idina Menzel), is actually the magically gifted 'Snow Queen' and it's her icy powers that threaten the kingdom, but as this is a Disney film, expect a fantastical tale of family, adventure, cute characters and happily ever after. 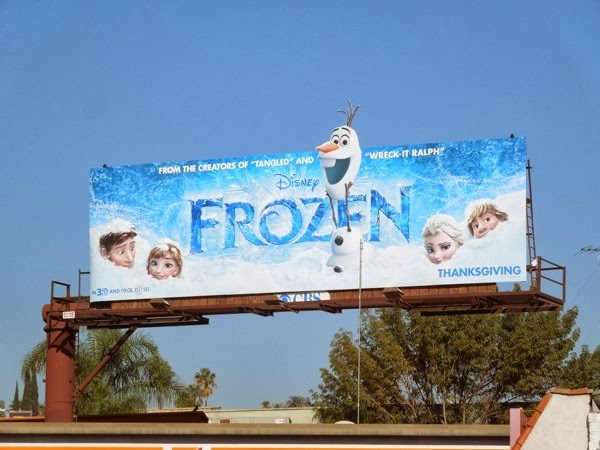 These Frozen billboards certainly bring some holiday cheer to the skies of L.A. and the special extension versions featuring the snowman Olaf with his head peeking over the top were spotted along Vine Street and Cahuenga Boulevard on November 6, whilst the smaller standard creative was snapped along Beverly Boulevard the same day. 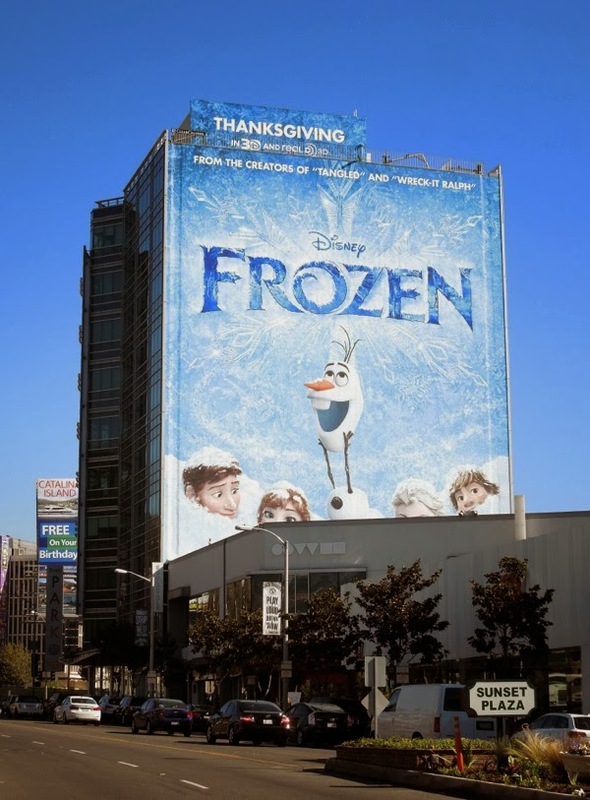 Meanwhile the giant-sized creative was spied towering over Sunset Plaza on November 13, 2013. 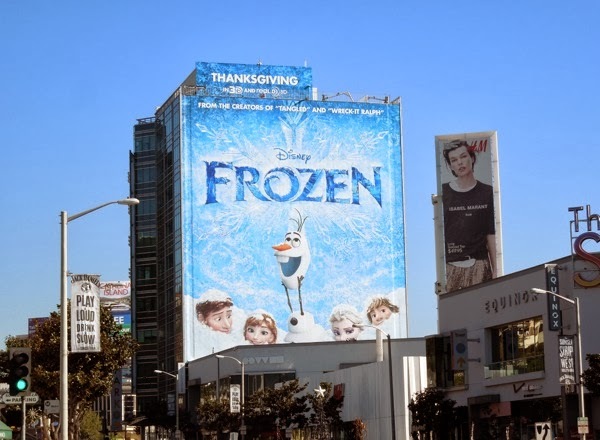 The only criticism that Daily Billboard has of this campaign is that you can't really distinguish the characters hidden in the snowdrift, although you can see why Disney didn't focus exclusively on the female characters to make it more appealing to a broader audience and not scare off the boys. 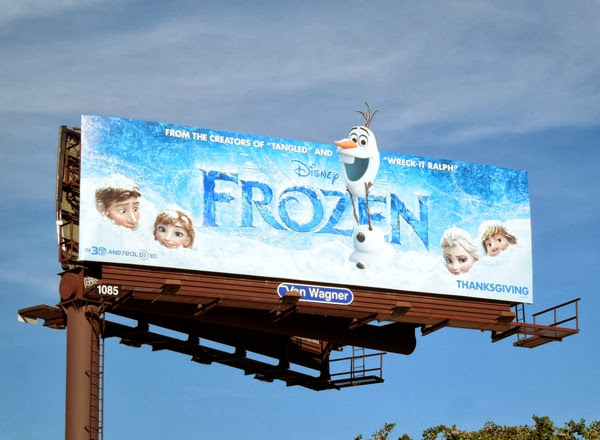 And while we're at it, where's the dopey reindeer Sven who's so fun in all the teaser trailers? 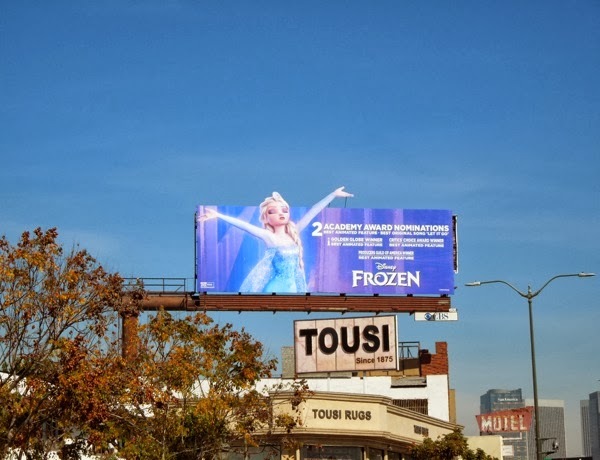 If you're a Disney fan, be sure to also check out all these other fantastic Disney billboards from previous months and years around the streets of Los Angeles. 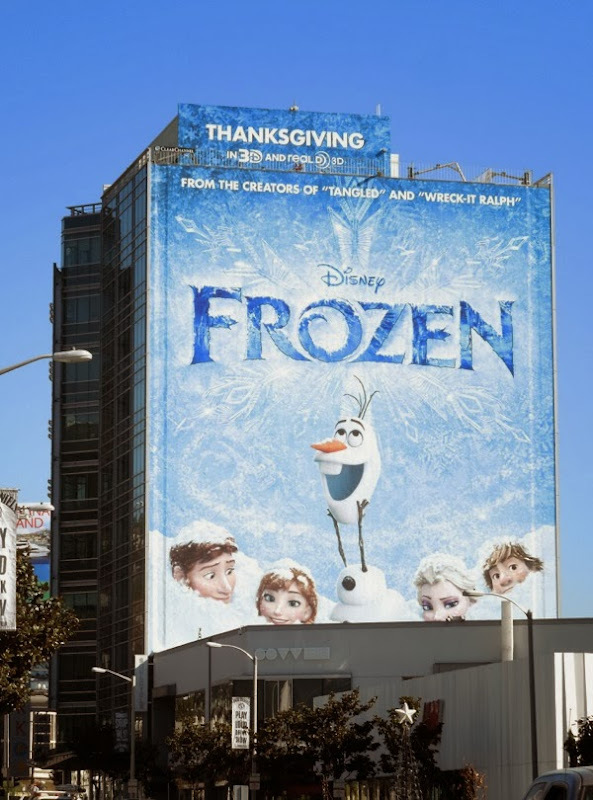 UPDATED: Not only has Frozen been a box office success, already having taken over $382 million globally as Daily Billboard types this, but it's also been heralded as one of Disney's best animated feature films in years. 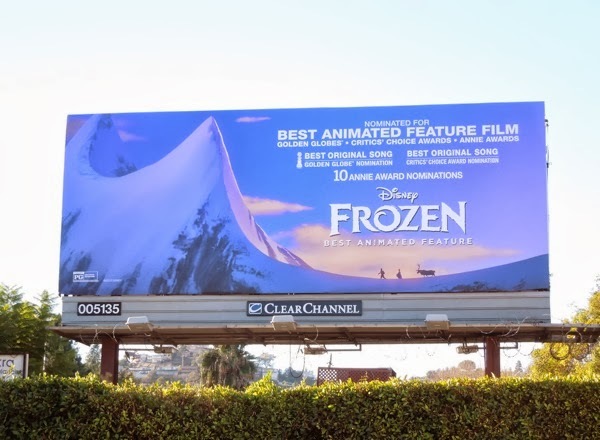 Here's an awards nomination billboard for the Golden Globes, the Critics' Choice Awards and the Annies (for excellence in animation), snapped along Barham Boulevard on December 28, 2013. 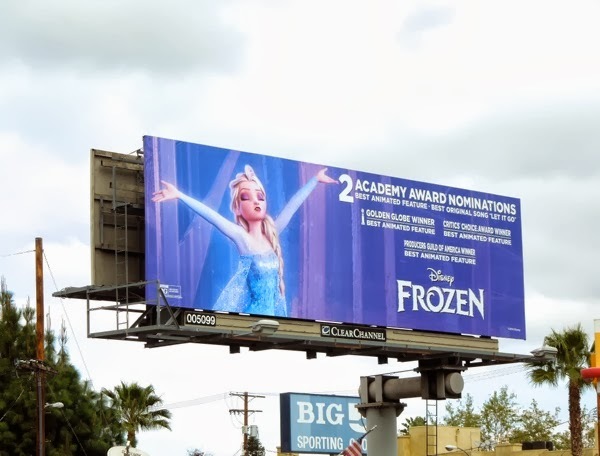 UPDATED: Now that Frozen has won the Best Animated Feature Film Golden Globe, five Annies, including Best Animated Feature, Best Directing and Best Music, plus countless other industry and critics awards, it's time for the big countdown to the annual Academy Awards. 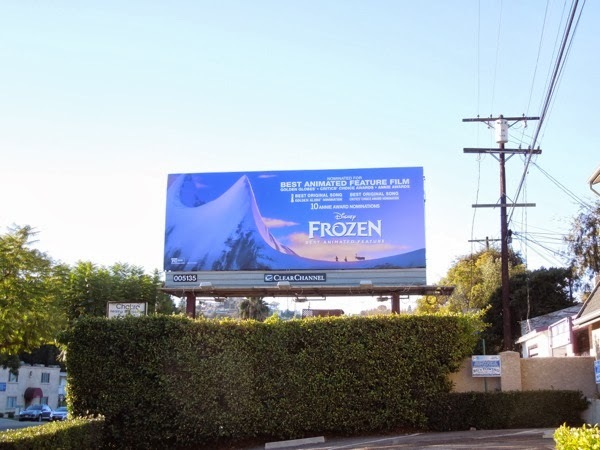 Here's an Oscar nomination billboard featuring 'Elsa', which is sure to brighten any day, no matter how gloomy, snapped along Venture Boulevard in Studio City on February 7, 2014. 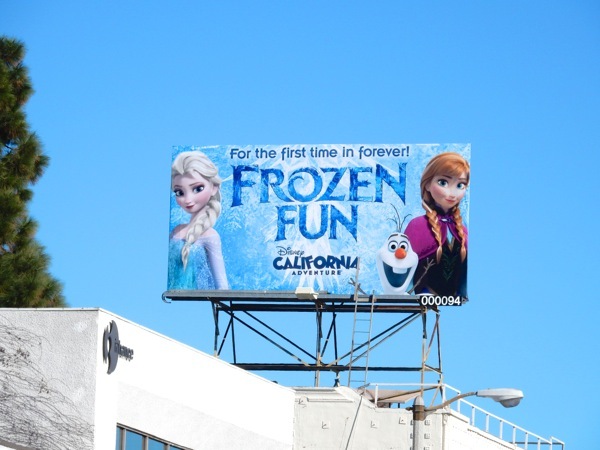 UPDATED: If you liked this Elsa creative (and Daily Billboard knows many of you did from your feedback and visits), then you'll love this special extension version of the Snow Queen, spotted along Santa Monica Boulevard at Westwood Boulevard on February 13, 2014. Knowing her spectacular voice is provided by Broadway legend Idina Menzel it's hard to look at the Disney character and not imagine her with darker hair. 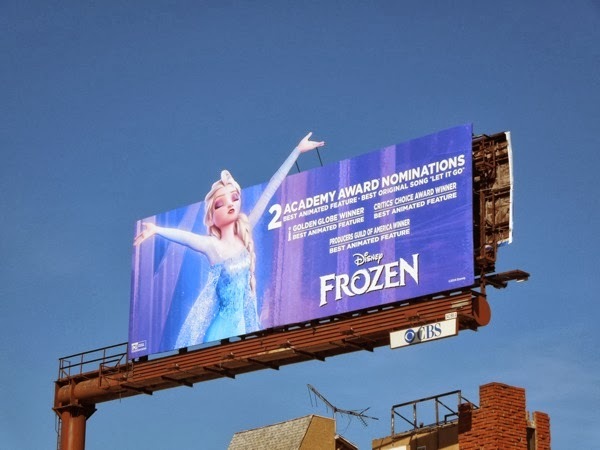 Let's hope her rendition of 'Let it go' will help Disney's Frozen secure the Oscar for Best Original Song, and the crowning achievement of Best Animated Feature too. 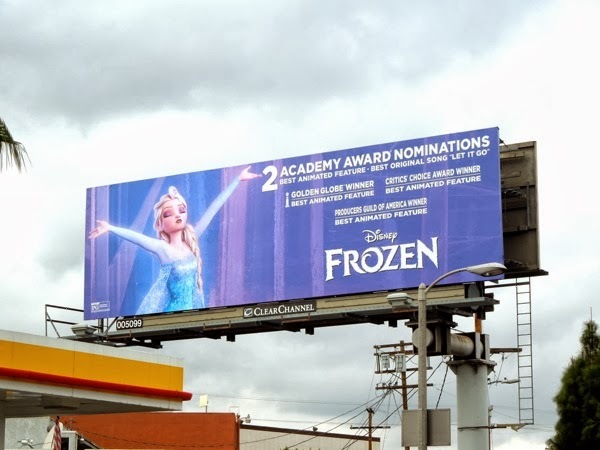 UPDATED: As we now know, Frozen's 'Let it go' did win the Academy Award for Best Original Song and for Best Animated Feature Film and it didn't take long for Disney to incorporate the blockbuster movie into its theme parks. 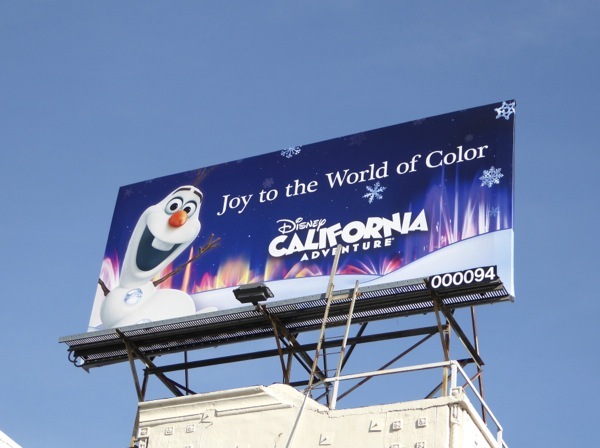 This 'Joy to the World of Color' billboard featuring Olaf the snowman was snapped above Wilshire Boulevard on November 21, 2014. 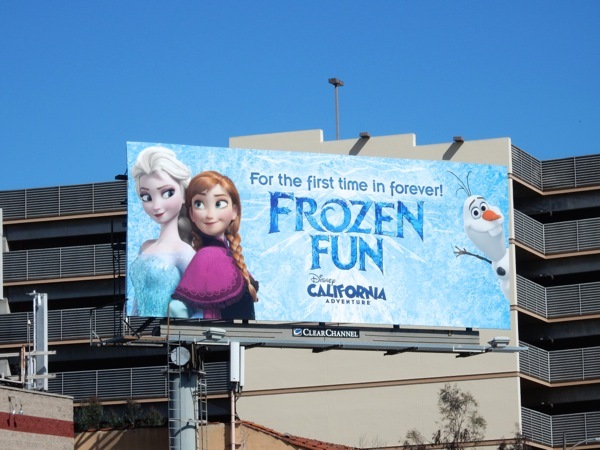 Meanwhile in 2015 Disney's California Adventure park introduced its 'Frozen Fun' attractions, and these billboards were spied along Beverly Boulevard on January 15 and above Olympic Boulevard on March 13, 2015, respectively. 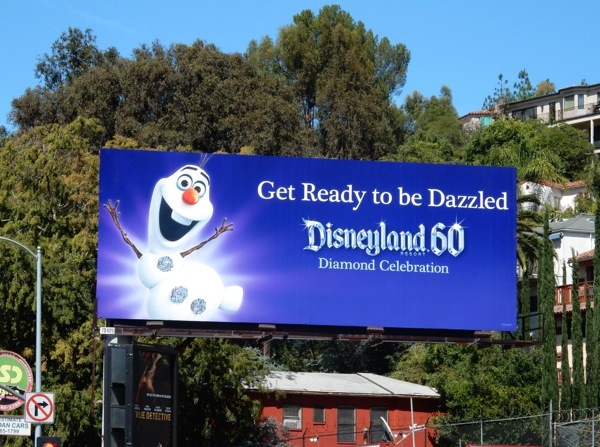 The fun included sing-along celebrations, Olaf's snow fest, Anna and Elsa's royal welcome meet-and-greet opportunities, wintery dance parties and Frozen merchandise galore. 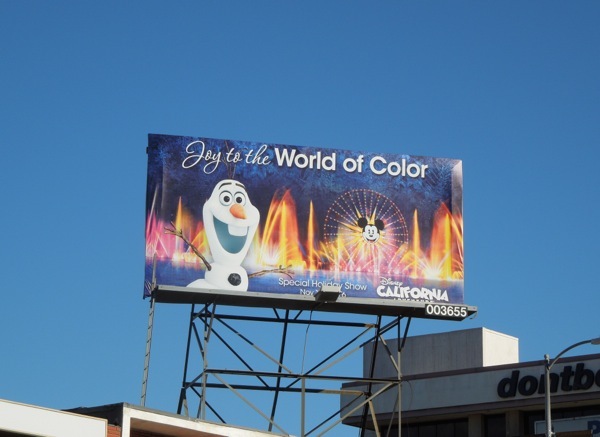 The Frozen characters were a big part of Disneyland's 60th diamond anniversary celebrations (and park advertising) like in this dazzling billboard snapped along Barham Boulevard on July 2, 2015 and once again part of the holiday festivities with this 'World of Color' ad creative above Beverly Boulevard on December 8, 2015. 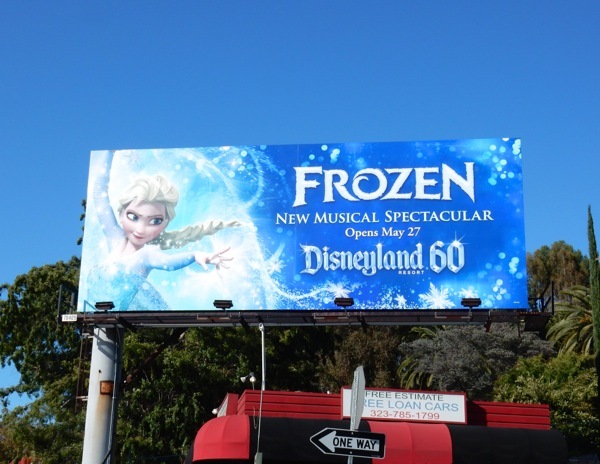 Meanwhile this new Frozen musical spectacular was spotted along Barham Boulevard on May 25, 2016. 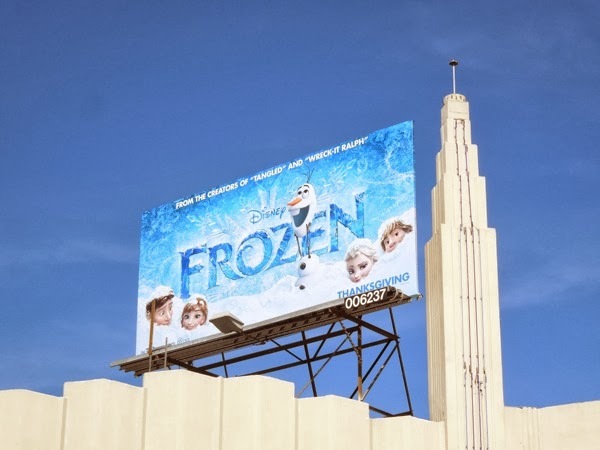 Daily Billboard is sure Frozen will continue to be a fan-favourite and have a constant presence at the Disney parks in the years to come.